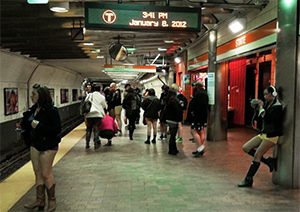 Kudos to the hundreds of brave Bostonians who soldiered pantless through windy, sub-freezing temperatures last Sunday. This video is for them. January the 11th marked the 8th anniversary of the No Pants tradition in Boston, which has grown to include walks through famous landmarks and a no-pants no-cover afterparty. This year we returned to the fantastic sports bar,McGreevy's, where pantless staff served drinks and hot food to hundreds of pantless partiers. 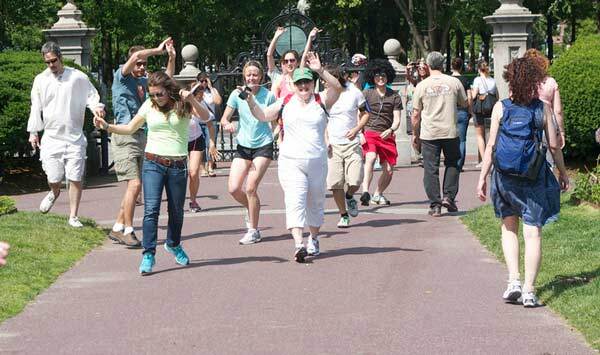 Photos of their daring actions can be found in coverage by Boston Magazine, BDCwire, and Boston.com. Of course you'll also find tons of photos on the Facebook Event Page and in our official photo album. To meet up for our next happening, subscribe. Thanks for another great No Pants Subway Ride! At least 270 people filled a total of 4 trains with bare legs and dead pan excuses. FOUR TRAINS. We're gonna need waaaay more volunteers next year! Please share your experience with us! Comment below or at www.facebook.com/SOScities. We heard a number of funny reactions from many of you over drinks at Kings. Send them in! We'll include a number of them in the official recap. Looking for photos? Check Boston.com tomorrow for pictures. Also check The Metro. There are rumors the Herald and Phoenix may have something on Monday as well.